Steven Reis, 55, was found inside 121 Sixth Avenue two weeks ago. Police were investigating a separate case when a suspect told officers that he knew where a body was, Chief David Halfhill told The River City News on Wednesday. Cadaver dogs were brought in to check out a disturbance in the basement's floor and when they picked up on something, the basement was excavated and Reis was found. "The autopsy was done today and the cause of death is still not determined," Halfhill said. "There wasn't enough evidence right now." The chief said that he expects an arrest or arrests soon but that he was still unsure of how many people may have been involved. The original suspect who led officers to the scene remains a person of interest and a woman who cared for Reis is behind bars. 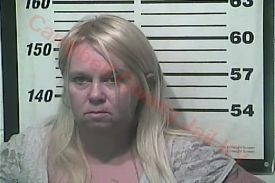 Christy Mae Russell, 40, rented the building where Reis's body was found. Reis was a veteran of the United States Air Force and suffered medical conditions including post-traumatic stress disorder, Halfhill said. Reis collected benefits for that reason and on Saturday, Russell turned herself in to police and is charged with accessing between $20,000 to $30,000 of Reis's benefits through a credit card, the chief said. Russell is charged with fraudulent use of a credit card (more than $10,000) and tampering with physical evidence. Reis, who bounced around from previous residences in Covington, Newport, Ft. Thomas, and elsewhere, met Russell by chance and she became his unofficial caregiver. Halfhill said that the case is not yet a murder investigation but that abuse of a corpse and tampering with evidence charges would likely be part of impending arrests. The chief also did not know what specific battle or issues may have caused Reis to suffer from PTSD. The owner of the building where Reis was found and where Russell rented is not a person of interest in the case, Halfhill said.